Hubley Toy Company crafted two tin-toy versions of Santa. The one without a tree is rarer and more valuable. As Christmas nears, some items go up in value instead of being on sale. Christmas-related antiques and collectibles often have upticks in value before the big day and are less sought-after on Boxing Day for another year. No Christmas could be without Santa, and the jolly elf? was often the model for a huge number of household items back the mid-1800s. Cast iron was ?a favorite medium to create many of these seasonal items, with Santa cookie cutters, cornbread molds, fireplace andirons and chocolate and ice-cream molds topping the list. 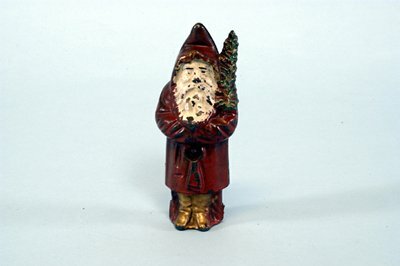 Cast iron toys were also a favorite item under the tree, often in the form of Santa’s sleigh or still and mechanical banks. One such bank was made by the famous Hubley Toy Company, founded in 1894 in Lancaster, Pa., best known for its toy horse-drawn sleighs, wagons and fire engines produced ?at the turn of the 19th century. 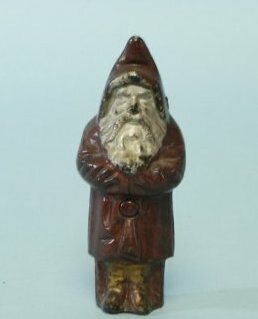 Hubley made two versions of the Santa still bank; the one made without a tree is the rarer of the two, and crafted circa-1906. In the more common variety, the Santa carries a tree. The difference a tree makes? About 50 percent of the auction price to collectors. According to our records of the latest sales for both, a Santa without the tree sold at auction in July 2012 for $1,200, with the more common Santa carrying the tree selling for in September 2013 being knocked down for $550. Another Hubley Christmas favorite, a circa-1910 Santa and his sleigh pulled by two reindeer in very good condition sold in December 2012 for $5,500. A second version by Hubley in good condition pulled by only one reindeer sold in December of 2012 for $1,000. As with all cast-iron toys, values depend a great deal on the condition of the paint. The same Santa sleigh with the double reindeer, but with its paint in very poor condition or missing entirely, ?can sell for less than $200.